Happy Holidays, everyone! As the holidays quickly approach, the time comes to start thinking about Christmas gifts! Below, we've picked out some of our absolute favorites this season for you to maybe share with your loved ones! Shop for the women in your life with a few stylish and personalized gifts, brought to you by yours truly! Bonus tip, all of these favorites are on sale today for the Black Friday Sale, so be sure to snag 'em while they're at such a great price! I want to start out with one of the classics this season that is a MUST HAVE in anyone's wardrobe - the Monogrammed Boyfriend Sweater! This essential sweater is the oh-so-cozy, easy to throw on, versatile top that every girl dreams of this season. If you ever have a tough critic you're shopping for, you can't ever go wrong with this decision, as it's flattering on every body type with a high-low hemline and side slits, and it comes in all of her favorite colors: Heathered Gray, Olive, Rust, Dark Mint, and Charcoal! Whether you're shopping for your daughter, BFF, mom or cousin, this sweater should be at the top of your list! You just can't go wrong with a neutral, cozy, pullover for this season. This personalizable Monogrammed Sherpa Colorblock Tunic can be dressed up or dressed down for the casual girl with a pair of Athleisure Leggings and Sneakers. It has adjustable with snaps at the neckline and zippers on the side to make it perfectly comfortable. The practical girl in your life will thank you later for this functional yet cute pullover! This sherpa material is also something that is absolutely irresistible for this time of year. She will keep warm all winter long in this cozy sherpa material! Let's talk about this cozy Sherpa duo real quick! Our Sherpa Vest and Monogrammed Sherpa Pullover Tunic are two pieces that you can't go wrong with this season. Not only are these the perfect fall pieces, but this sherpa material is just as soft as it looks! These are great transitional pieces from that cool weather to the extremely chilly temperatures as winter approaches. What makes them so great is their layering abilities, with either a pair of leggings or jeans and a layering top! For the mamas out there, yes, the vest and pullover tunic are available in BOTH adults and Marleylilly Kids! So if your little one loves to match her mama, you can create the PERFECT mommy and me look with this adorable duo! For the more fashion-forward girl, this Asymmetrical Snap Pullover Tunic should be your go-to! Known for its not-so-average lines in its style, this asymmetrical top makes people always take a second look! With two different colors to choose from, you can bring a little color to her winter wardrobe with this subtly chic tunic! This look is paired perfectly with a pair of leggings and booties for a perfect fall look! It's the perfect amount of simple, so she can dress it up and accessorize a Tote Bag. If you are shopping for someone who likes to layer, this is the perfect piece for her! Throwing on a Quilted Coat is the perfect way to warm up this look for a cozy winter look! If you're looking for a preppier style this winter, this Quilted Pullover Tunic is where you should be looking! This tunic makes a subtle statement through its pops of suede throughout the look. Like some of our other tunics, this one is worn best with a pair of leggings or jeans, but what makes it so unique is its mix of patterns and textures. The other color options have areas of plaid, as well as a quilted texture with pops of suede. This mix of patterns makes for an exciting and different feel which helps it stand out against the other Marleylilly tops! Whether she's on the go, hanging out with friends, or dressed to impress, this adorable tunic is sure to make the impression. The quilted texture & touches of suede make for an irresistible combination that is sure to impress her! 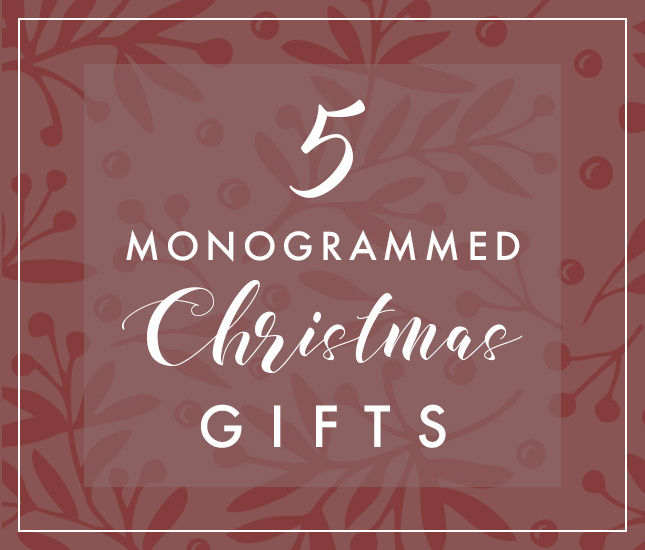 Be sure to let us know in the comments who you're shopping for this season and what monogrammed items you're getting them this holiday season! Don't worry...we won't tell them! :) Happy shopping!